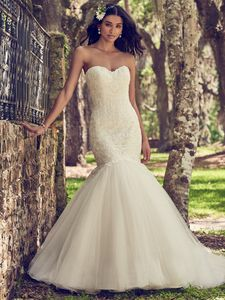 Description: his mermaid wedding dress features a bodice of shimmering lace motifs atop a voluminous tulle skirt. Complete with sweetheart neckline and lined with shapewear for a figure-flattering fit. Finished with covered buttons over zipper closure. Lace illusion jacket with half-sleeves sold separately.